​Such was the interest in brick-making that Colin (Science and Technology Group Leader) organised a second visit to the works of H.G. Matthews, near Chesham, on 29 September. We learned that this family-run business has been in operation on the site since 1923 with the ochre-coloured clay excavated from the surrounding fields delivered to the works three or four times per year. The company’s principal clients are English Heritage (now Heritage England) and the National Trust. Also, private buyers sometimes require hand-made bricks and tiles of a particular colour to extend their home if it is a ‘listed’ building. We saw the clay being prepared to eliminate traces of flint and other imperfections and then transported along a series of belts to a giant ‘vat’ from where the ‘purified’ mix is extruded into wooden moulds, hand-finished by a team of four operatives and stacked in racks ready for drying. Around 1200 bricks per day are produced in this way. Bespoke bricks (smaller in size or of a particular colour) are fashioned completely by hand. The physical demands of this latter process looked truly exhausting. Eight drying rooms (including four massive wood-chip biomass boilers – in collaboration with the Forestry Commission) dry the bricks over a period of about a week, after which they are stacked in one of three oil-burning kilns and fired for a day at a temperature of around 1000c. This is where the skill of the brick-maker comes in: the position of the bricks in the kiln determines the colour of the finished product; the closer the material to the sides of the kiln, the lighter in colour it will emerge. 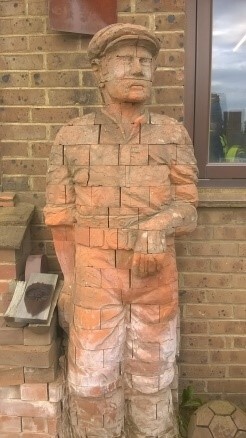 There were no sensors in the kiln to guide the brick-maker in his choice of position to ensure that the finished product would satisfy a particular demand in terms of quantity. Moreover, the process of loading and unloading the kilns by hand seemed highly labour-intensive and extremely heavy work. The tour concluded with a glimpse of eight wood-burning kilns used for firing small quantities of salt-glazed bricks required for ‘heritage’ designs. To say that most of us were absolutely astonished at the labour-intensive, hands-on, ‘artisan’ method of producing beautiful bricks and tiles is, I think, an understatement. Even more so, given that each ‘regular’ brick would cost the buyer as little as £1.20 (give or take a few pence) and the totally hand-made ‘specials’ not a great deal more! Thanks go to Colin for organising such an interesting morning. I certainly found it fascinating.